Social Media Customer Service: Be A Super Hero! We hear a lot in our industry today about how social media is changing. It’s getting harder to manage, difficult to navigate, almost impossible for some of us to gauge the value for our businesses. You post, tweet and pin, spending hours looking for stuff to share, and never know if it’s even worth your time. The opportunity to harness social media for customer service? Golden. Can you leverage your social media to increase customer service? Recently I saw a Facebook post by a friend of mine who was absolutely irate about a group dinner at a popular upscale restaurant. Her post was detailed, descriptive and by all accounts accurate. Her review of the dinner – and most importantly the service – was exactly what you would want to know about a business before you went there! 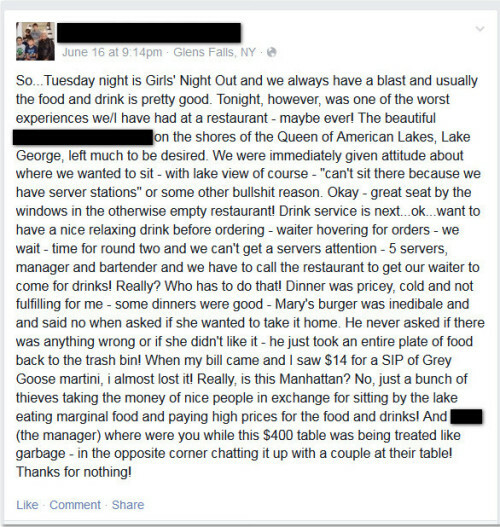 You can imagine the many responses to this Facebook post from people who have had similar experiences, who took this review of this restaurant and shared it on and offline with friends, families, business associates. Nobody wants a dinner experience like this one. The truth is, with the power of an instant audience, business owners are actually held to a different standard than they might otherwise be! People are far more likely to share bad news rather than good. You can imagine the post likes, shares and comments this received. Closely monitor what is being said about you on Facebook. Don’t panic if you get a bad review…this is a valuable opportunity for you to get some 1:1 outreach with a customer…and all their friends. If you do get a bad review, or comment, don’t pretend it didn’t happen, and don’t remove them! Reach out immediately with a thoughtful approach that aligns with your corporate social media guidelines. Thank them for bringing it to your attention. Use Messenger to directly connect with your customers, or reach out via phone or email. A warm and sincere apology like you would give to a family member is in order here, followed up by a solution that meets or exceeds the customer’s original expectation for product and service. Follow up at a later date to make sure they are still happy customers. The business owner above did everything right…you can see the appreciation that the customer felt after being recognized, contacted and treated the way they expected to be treated, and the value to the business of knowing what they need now to do. At eVision Digital Marketing, we understand the value of a positive customer experience. Contact us for information on how we can help you craft a strong online and social media profile!